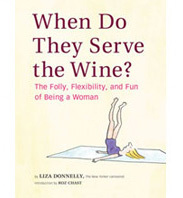 Cats, Dogs and Egypt | When Do They Serve The Wine? Coming up with six or more ideas to submit to The New Yorker every week, I do ones that are not great. Like the one above. It’s a stupid joke, playing off the protests in Egypt. It’s one of those cartoons that really doesn’t mean anything, and I fear treads on being disprespectful of what is going on in Egypt, which I by no means intend. But one way to find the good cartoons is to do the bad ones. The more you create, the more chance you have of working it out and finding the gems. The dog and cat scenario is a classic format for cartoons. So is signage. I have done hundreds of both (well, maybe not hundreds), but have never combined them. 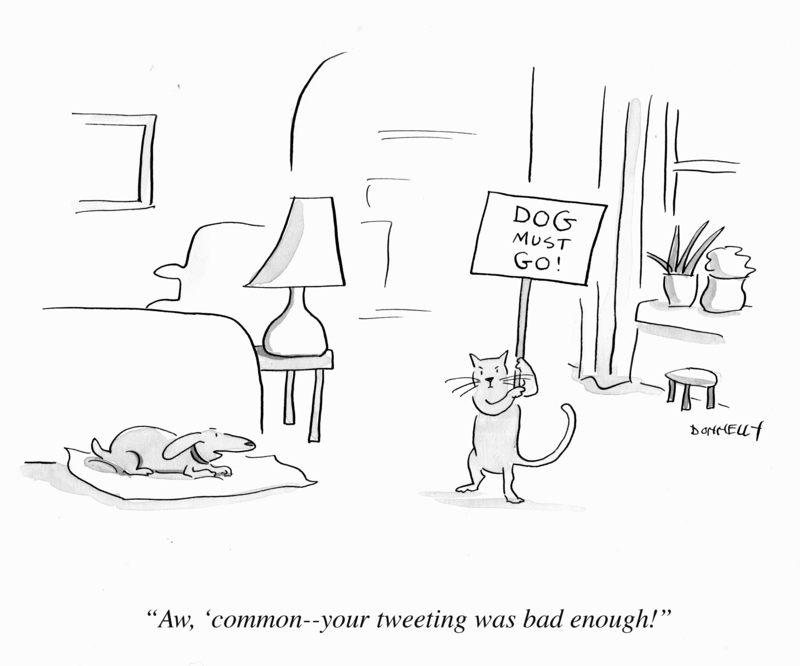 Cat/dog interaction is symbolic of conflict, so there are many ways you can use them. I like to imagine the cat tweeting endlessly that she wants the dog to be removed from the house. 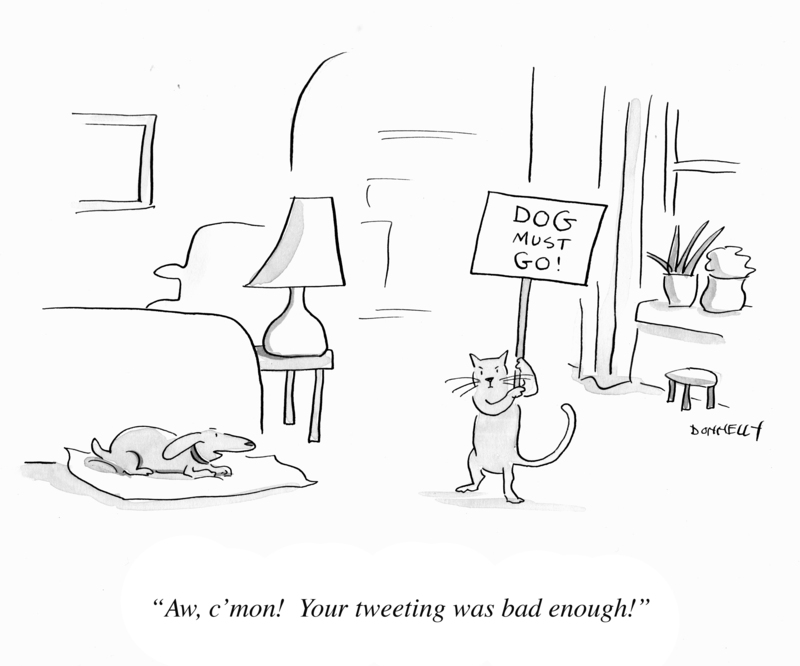 This entry was posted in Random but Relevant and tagged Cartoon, Cat, dog, Egypt, New Yorker. Bookmark the permalink. i work as a cartoonist to, and i am currently drawing a toon that plays cats and dogs against each other and their inherent opposite of character traits that exist within them. for example, in one of the panels i have the juxtaposition in playing habits with humans. i did giggle at your toon. I like the cartoon because it reads “conflict” but it is one level comfortably removed from the human situation. It’s easy for me to find the humor in a dog-cat negotiation. And I find it easier to take it to next (and more difficult) step of human negotiation. It is an “easing” into what’s to come in these current democracy-seeking discussions. Thank you!